We typically avoid chain restaurants because we would rather give our business to local business owners. We particularly hate corporations in that not only do they pay their workers a lousy wage, while the big executives at the top rake in all the money; but they also have a habit of trying to squash the competition, and to do whatever it takes to make money. Whenever the goal of a business is primarily to make money, rather than to glorify God and serve people, there is no incentive for that business to operate on Biblical principles or to do the right thing. Making money should be the by-product of living in obedience to God. Anyhow, in receiving a better paying job in the current company I work for, and in my desire to build stronger relationships with both my wife and children, I am taking up the weekly date. One week me and my wife, the next week either myself or my wife with one of the children. Last week I took my wife to Bob Evans, because, we couldn't figure out a good local place on the fly, and we hadn't been there for several years, and wanted to see if they were anything like they used to be. Unfortunately they were not. I did tell my 12 year old daughter I would take her there once to experience their Wildfire Chicken Salad once. We used to buy the Wildfire sauce and make the salad ourselves on a regular basis (before we started trying to make our own version of the sauce, which we could never get to taste the same-- but we dealt with it). These comments are not regarding the restaurant itself, but concerning your franchise as a whole. 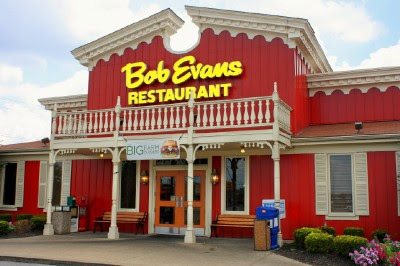 We visited Bob Evans in Cuyahoga Falls recently, but also just today, the one in Stow, OH. What I thought was an individual restaurant problem is actually just an overall franchise problem. The quality of your food and service, and the type of employees you hire, has gone way down hill. The last time we visited Bob Evans things were not this way (a few years ago). Furthermore, we discovered you no longer sell your wildfire sauce. One worker whom I asked about it said at first that they problem just ran out of it, because "they go through it like crazy" with people buying it so much. Then she asked her manager about it, and he said you discontinued it because "we don't sell enough of it", LOL. It sounds more like that you didn't want people actually making the salad and other signature dishes at home with the sauce, instead of coming to the restaurant to buy it. Bob Evans franchise is committing a slow suicide. It used to be more like Cracker Barrel, but now it is more like Denny's. It's like a sit down fast food restaurant. I guess I shouldn't expect much more from a corporation. But in a way it is still disappointing. This just reinforces in my mind that we need to try to stick to the small, local restaurants. That and, do other kinds of activities for dates, which we plan to do. Do you have a regularly scheduled date with your wife and children? Focus on the Family has something I ran into recently called Date Night Challenge. Though their ministry is extremely compromised, they do have some great ideas from time to time, and this one is no exception. And they are dead right in their belief of how important it is.